Charles Augusta 'C.A.' Potter, Jr.
Charles Augusta 'C.A.' Potter, Jr., son of Charles Augusta Potter, Sr. and Ora Lee Grammer, married to Betty Jean Walker and buried in Elmwood Memorial Park Cemetery, Abilene, Taylor County, Texas. 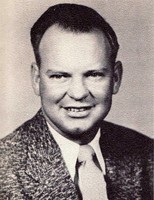 South Taylor County Independent School District High School Principal and Teacher (1954-1957).